413 EAST CHAPEL HILL ST.
Is not there actually a business in 405/407? You're right Joe, my error - thanks. I've changed the post. I'm curious if anyone knows what "Addison's Play World" was all about...the mind reels with the possibilities. Hipster nugget: 409 houses Flywheel on the ground floor, but the rest is the HQ of Merge Records. I was just going to say that hover. A great, but probably unknown to some, aspect of this city (Merge that is). I was hoping to see this block talked about here just for its sake. Guilty. Thanks - I'll add Merge to the post; I didn't realize that this is where they were located. Why no hipster sign? In an upcoming picture/post there is a billboard for the new "Columbia Bikes" on sale at Addison's PW, so I think it was good, clean-cut, tyke-ster fun. I wonder if a big ol' toy store could make it downtown these-a-days. Addison's Playworld was a store owned by Angle Addison in the '50s thru the mid or late '70s I think. Not sure exactly when it closed. It included kids toys, hobby shop, baby furniture, sporting goods and one of Durham's oldest bicycle shops. I had the honor of working (part time mostly) in the bicycle shop from 1964 through 1972 while I was in high school and college. Mr Pate headed up the bicycle shop. Mr Addison died many years ago and perhaps his heirs still maintain ownership of the building. He had two sons - One was named Dana. I cannot remember the other name. Brings back many fine memories. I'm researching the history of Durham's cycling community, and I would love to talk more with you about Addison's and its bike shop. Would you get in touch with me? Mr. Addison's other son is Duane. The unidentified young woman looks very much like daughter Diane, who would have been 21-22 years old in 1969. In the fourth and fifth pictures from the top, you can see Ward's Furniture between Brass Rail Billiards and Addison's Playworld. My dad, Philip Ward, opened the store in the late 40's/early 50's with his brother, Foye Ward. "Addison's Play World" was a toy store that also included small-scale camping supplies, etc. One of my friend's father owned this store. In fact, after I graduated from Durham High School, I worked during the summer for Mr. Addison at a "camper sales" business that he opened. The first "real" toy store I remember. There weren't many boy toys there I didn't covet. Addison's was a little pricey for my folks but for my 12th birthday my father took me there and bought my heart's desire. A recurved bow, 6 target arrows and a finger and wrist guard. I was very careful with my arrows since I almost lost one my first day. Soon, being a carpenter, he taught me how to make my own. I was the Rodin Hood of the local woods for years! Addison's playworld. my brother bought a bike for me from there. he claimed Santa got it for me. will never forget it. he worked there part-time too. it was a wonderful place, 3 floors of toys. the basement had bicycles. i could spend a whole day in there. glad to see it was not demolished. wonder what ever happened to Mr Addison? didnt think i would ever ever come across a picture of it. thank you so much. Before this building housed Addisons I it was occupied by the Seeman Printery, established by my great-great uncle Henry Seeman. Seeman Printery moved to a brand new, much larger building on Chapel Hill Blvd. in the late 1950's. My grandfather, Joseph Albright, worked at both locations from his early teens until his retirement. 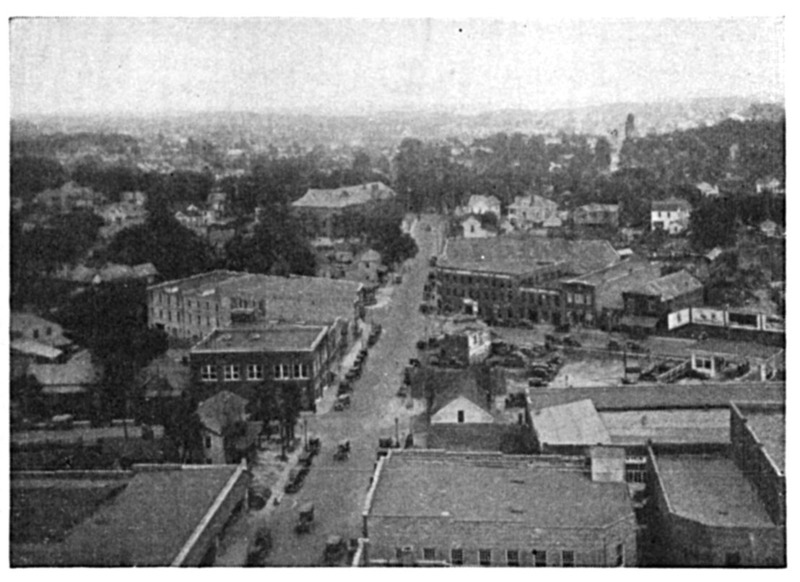 The 400 block of East Chapel Hill Street was primarily transformed from a residential into a commercial street in the 1920s. The above picture shows 401, 405, 407, and 415 had been built by 1924. 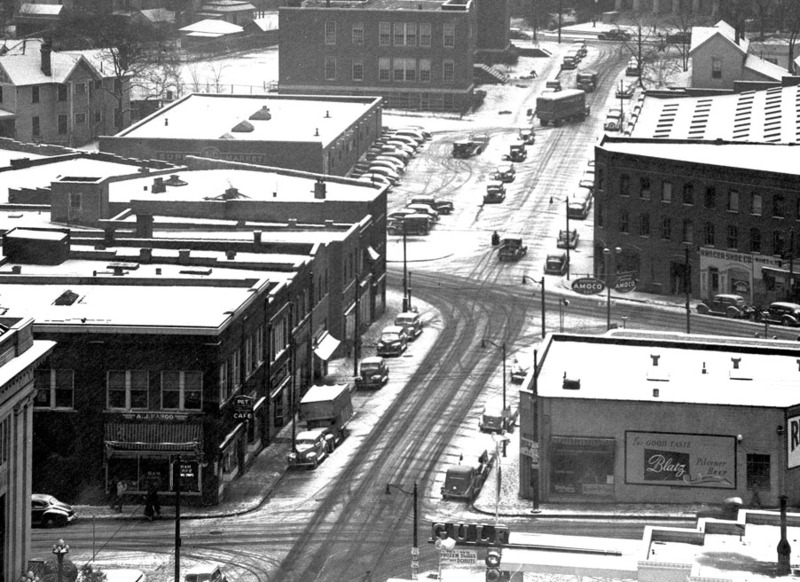 By the 1940s, the block was built out. 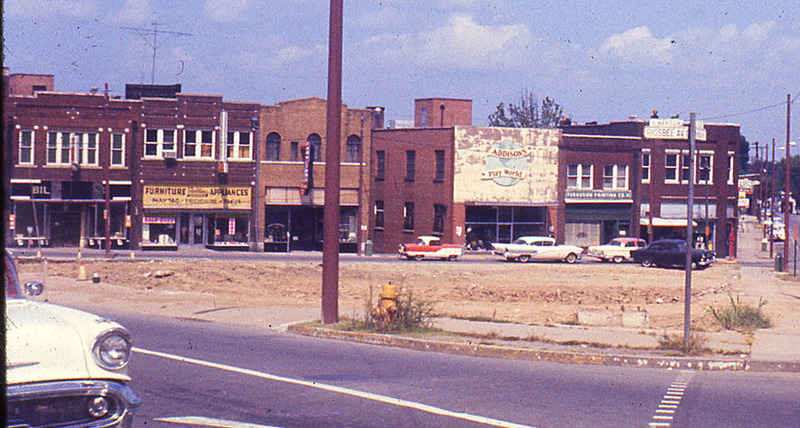 The below shot gives a clearer view of businesses, including McGhee furniture, Brass Rail Billiards, and Addison's Playworld. Below, mid-1960s, shows some changes in the line-up. 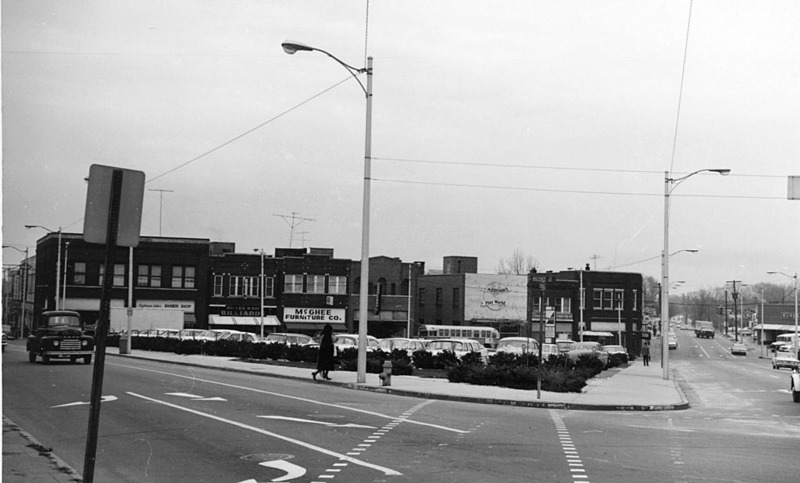 Looking north from Rigsbee and Mangum, 1961. 413 East Chapel Hill was home to Addison's Playworld from at least the 1960s - and it was, from what I can gather, much beloved by kids in Durham. Interior shot of Addison's, captioned "Spacecraft at Addison's - 07/28/69". The woman is unidentified. I'm unsure when Addison's playword closed, but it was certainly during the 1970s. As of the early 21st century, this is one of the most intact blocks of early 20th centry streetscape remaining downtown. Ward Furniture Occupies 405 and 407 - although there has been talk that Rue Cler might expand into 405 (same owners), 407 has a bank trustee name as the ownership, which isn't usually a good sign, but I read a few months back that the property had been transfered to John Warasila of Alliance Architecture, so I'm not sure what is going on there. 409 contains Flywheel Design - a cool graphic design/web design studio - on the first floor, but the building is owned by Merge Records which is headquartered on the upper floors. Merge began in 1989 in Chapel Hill, but moved to this building in 2001; it has some great bands on its label, including ~5 of my personal favorites. 413 is no longer Addison's Playworld, but the ownership is still "Playworld, LLC." 415 appears to be an investment banking office. This block is architecturally in great shape - it has traditionally suffered from the isolation brought on by the parking deck, city hall, the crazy loop between Mangum and Roxboro, and the dead space to the west brought on by empty buildings and the "We Want Oprah" parking garage. The success of Rue Cler might begin to improve some of the rest of these spaces, although I don't think it can reach its full potential without improving some of the surrounding issues. The building was renovated in 2008, and as of 2011 houses apartments upstairs and a hair salon in the first floor retail space.